While in Vancouver, I had a business meeting in the private room at Cin Cin, an old school Italian eatery on Robson Street. I was shuffled to the private room which housed hundreds of bottles of wines, some at hundreds of dollars. Speaking of cost, expect to pay a pretty lira here; apps are $13-18, pastas start at $15 and entrees go from $30-45. Noise was an issue even in the private room. The only thing separating us and the boisterous outside crowd was a thin sheet of glass and a thick wood door that constantly opened and closed, allowing the drone of human banter to roll in like thick fog.There was a four course set menu featuring an array of choices for the appetizers, mains and desserts with a mushroom risotto as a middle dish. 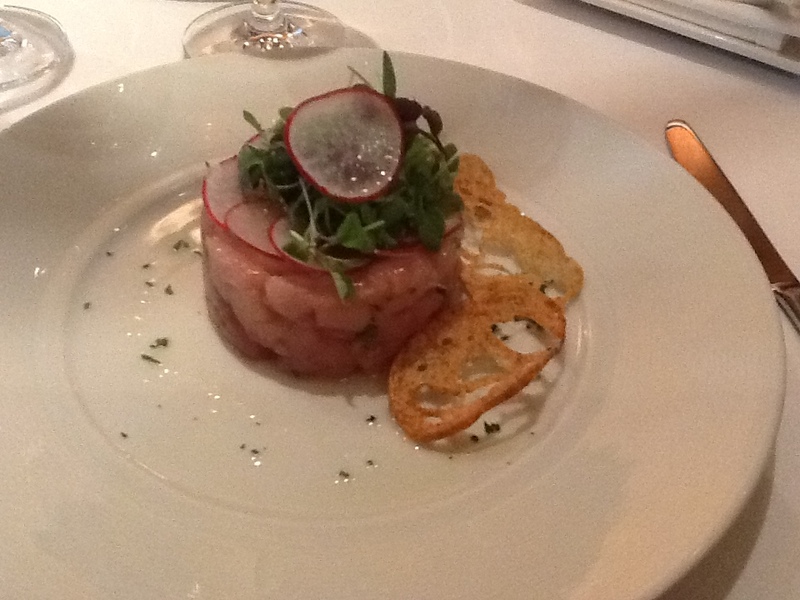 I opted for tuna tartare to start. It was a large portion on the modest side of seasoning and acidity although I got the odd big chunk of salt here and there. The radish was a nice addition to add a bit of crunch to the otherwise silky texture. 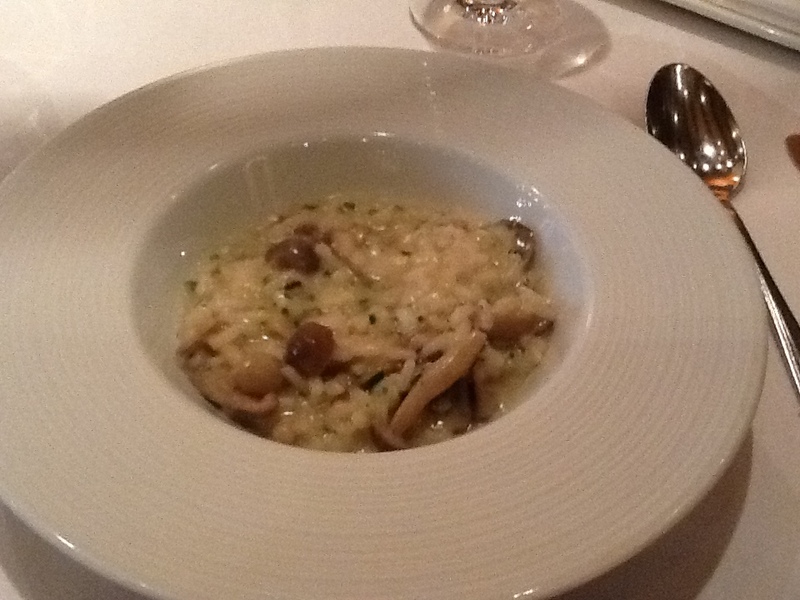 The risotto was well prepared and seasoned nicely. The rice had a subtle crunch and there were plenty of tender mushrooms scattered throughout. It was served hot and it held its temperature well. The sable fish was treated with the utmost respect, its delicate integrity preserved in the cooking process. Ever bite melted like butter in my mouth. The mashed potatoes were subtle and allowed the fish to shine. The kale was simply and perfectly prepared and added great colour, texture and a punch of bitterness to the sweet filet and creamy mashed potatoes. I strayed from my normal tendency to order tiramisu for dessert and opted for a lemon tart instead. It really wasn’t a tart; it was served cold and with a side of strawberry coulis that brought me back to days of scraping the last morsels of baby food off the side of the jar and shoveling it into my kid’s waiting mouth. The tart as a whole had that “sitting there for a bit” taste. There is pride in the service, characterized but constant wine and water pours by the head waiter who is as well seasoned as the risotto was. The table’s dishes were served by numerous waitstaff on a way that would make the Canadian synchronized swimming team envious. I received “Sir, that’s an excellent choice!” for each and every order I placed, an accolade I’m not sure was entirely deserved, especially in the midst of my tiramisu regret. 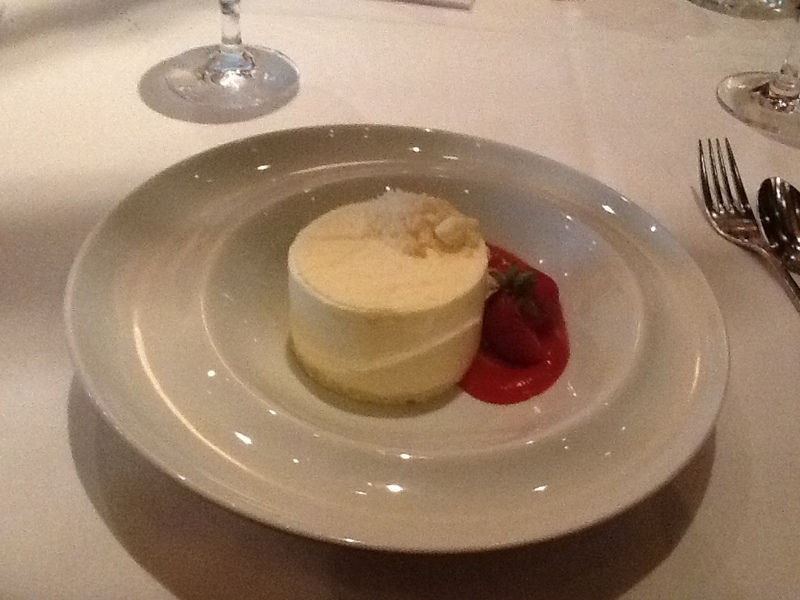 CinCin is a well established and expensive Italian restaurant promising good food, good service and good wine. 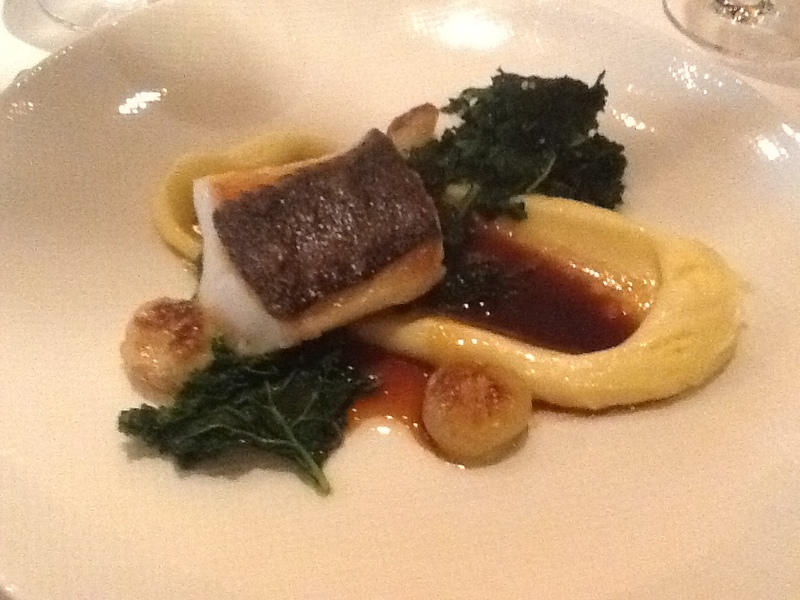 The sablefish was spectacular and clearly the godfather of the evening. The rest of the food was more Godfather III. The decor is old school Italian villa; respectfully cheesy while embracing the dwindling art of old school service which is as much choreography as it is functional. However, there is no music for the dance. Instead there is plenty of noise which could become quite aggravating if you have anything important to say or hear…like how great my dinner choices were.